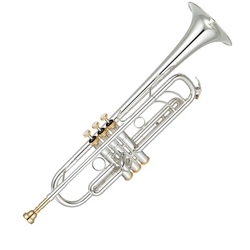 25 years have passed since the Xeno trumpet series was introduced in 1990. To celebrate that landmark, Yamaha has applied a quarter century of accumulated skill and know-how to the Limited Edition YTR-8335RS25TH. The sound is warm and brilliant, with a gentle maturity that could only grow out of a long and illustrious history. The bell, with its “Xeno 25th Anniversary” engraving, is one of this model’s most notable features. With thinner bell used in the YTR-8310Z, a little larger than standard, it produces a tone that is simultaneously warm, bright, and soft. Outstanding width and projection are also appealing characteristics. Curved double tuning slide braces are a striking visual feature that also provides sonic benefits. The flowing form of this brace adds ideal resistance to a free-blowing reverse tuning design. The dual brace configuration, a rarity in reverse tuning models, serves to stabilize the instrument’s tone. The same hollow-head 3rd valve slide stopper screw contributes to subtly freer blowing resistance while improving overall playing feel. The barrel-shaped ferrule is the same type used on the Xeno Artist Model, adding even more depth and richness to the instrument’s timbre.